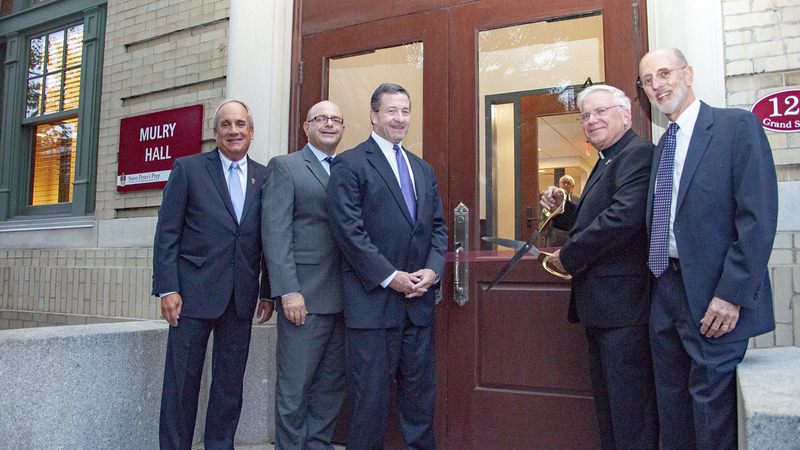 Cutting the ribbon for the newly renovated Mulry Hall were, left to right: Jack Caulfield, ’71, P’00,’03, VP for Finance; Jim DeAngelo, ’85, Principal; Phil McGovern, ’76, P’11, Chair of the Board of Trustees; Fr. Ken Boller, S.J., President; and Jim Horan, ’70, VP for Planning and Principal Giving. More photos. Last week’s dedication of the newly renovated Mulry Hall, during the annual President’s Reception, marked not just a new era for the iconic building at the crossroads of Prep’s campus, but also the conclusion of a successful 12-year journey for the Imagine Campaign. Imagine: The Fund for Saint Peter’s Prep, to use the campaign’s full name, has seen Prep’s alumni, parents, and friends contribute a total of $56.6 million since its inception in 2006. 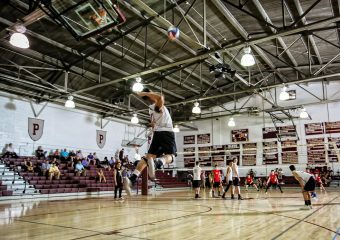 Roughly half of that – about $27 million – has enabled a radical transformation of Prep’s campus in order to keep up with the school’s evolving needs. Starting with the opening of O’Keefe Commons in 2010, Imagine has gone on to fund the conversion of Burke Hall into the Moriarty Science Center (2011), the exterior restoration of Hogan and Mulry Halls (2014), the construction of the all-new Perkins Athletic Center (2016), the interior renovation of Hogan Hall (2017), and now the interior renovation of Mulry Hall. In addition, led by the extraordinary support of Gerald V. Sheehan, ’48 in establishing the Sheehan Scholars Program, and including all gifts to endowed scholarships and restricted tuition support, the campaign raised around $29 million for merit- and need-based awards to students and their families. 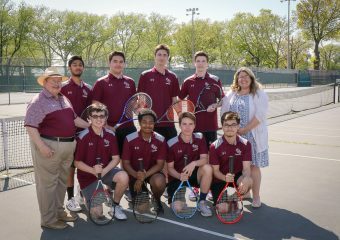 The video below provides an overview of the campaign and how it has shaped Saint Peter’s Prep over the past twelve years. As for Mulry itself, what was once an outwardly handsome building that contained a pastiche of oddly shaped rooms, purposed and repurposed for mixed and ever-shifting uses, is now a purposeful home for Prep’s academic administration, IT services, guidance and college counseling offices, and Browning Learning Center. Previous: Previous post: Fashion Show Raffle Donations Wanted!